Most people go trick or treating to get the treats and avoid the tricks. However, we all know that sometimes the tricks get us when we least expect it. That is why we came up with some tips that will keep your Halloween safe. We know that many costumes consist of spooky masks and eccentric face makeup, but make sure this isn’t a vision barrier! When you are walking around from house to house, you need to be able to see where you are going. Without your full line of vision, it is very easy to run into something or to trip and fall. Going along with the previous tip, make sure that your costume cannot trip you or others. Many trick or treaters do a good amount of walking on Halloween. 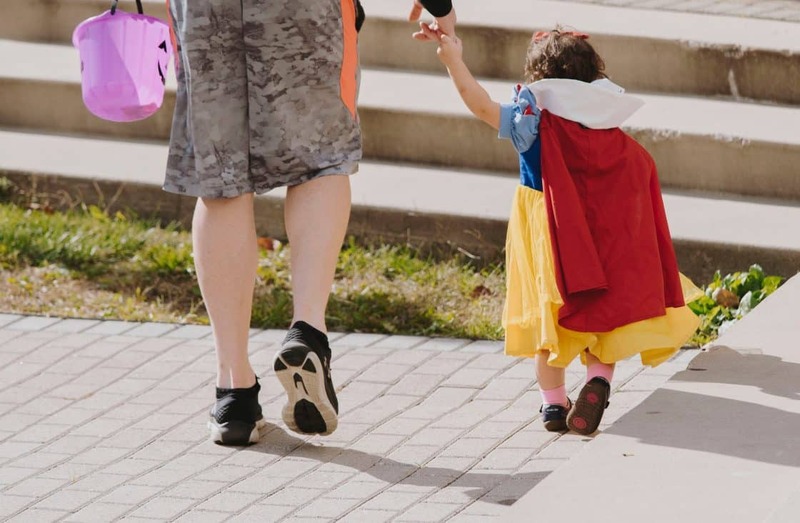 If your costume is oversized or dragging, you are at risk for falling and injuring yourself. Again, it is so important that you have full vision so that you do not trip over anything. It can be useful to carry around a flashlight so that you can always see where you are going. When crossing the street, make sure you are looking both ways first. The road should be clear of any traffic before you cross. Children should always have a responsible adult attending them while Trick or Treating. Make sure items from the Halloween haul are safe for your children. This means throwing out food items that look unwrapped or unusual. If you choose to participate in Trick or Treat festivities, make sure your lawn is child proof. There should be no wires, hoses, tools, etc. in your lawn that children can trip over. Rake all fallen leaves. A clutter-free yard will lower the risk of injury from your guests and will also limit your liability in a circumstance where someone is injured. Make sure that your pets are away from the trick or treaters. This way, you will not have to worry about anyone being bitten or injured. Not only will this let trick or treaters know you are open for business, but it will also help them see! Having front floodlights on your home will give your trick or treaters ample vision to see where they are going. Halloween is a fantastic holiday full of laughs and scares. Enjoy it by following these safety precautions. We hope you nothing but treats this Halloween season!